Preparation time: 15 minutes. Chilling time: 1 hour. Wash and trim asparagus, removing tough ends of stalks. 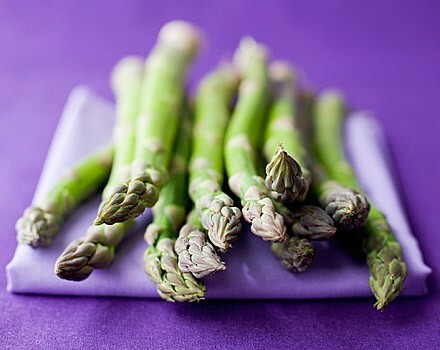 Place asparagus in a microwave-safe dish with a small amount of water, cover, and steam in microwave approximately 5–7 minutes until crisp-tender. Cut cooked asparagus into bite-size pieces, cover, and refrigerate. In a small bowl, combine the remaining ingredients (except cherry tomatoes), cover, and refrigerate at least one hour. Just prior to serving, toss the chilled asparagus with yogurt sauce. Fold in cherry tomato halves. Exchanges per serving: 2 vegetable, 1/2 lean meat. Carbohydrate choices: 1.